For about 50 years since its inception, Shobunsha has published numerous maps and travel information, building its own sales channels at bookstores and convenience stores nationwide. 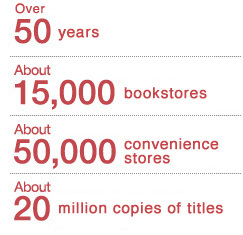 Today, Japan has about 15,000 bookstores and 50,000 convenience stores. Almost all these stores carry MAPPLE publications whose copies add up to 20 million a year. MAPPLE is so popular with Japanese consumers that myriad tourists across Japan get around with MAPPLE guidebooks in their hands, and many cars on the road are said to have MAPPLE maps sitting in them. The brand enjoys this established status of being Japan’s number one and only brand in the field of geographical information tailored to tourism. 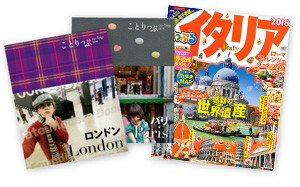 Tourist spots in Japan are not the only destinations that our guidebooks cover. We visit and explore overseas tourist sites and attractions to publish guidebooks for Japanese travelers. Our travel guides cover popular countries and regions around the world, ranging from the West (e.g. France, Italy, the United Kingdom, the United States) and Asia (e.g. China, Korea, Singapore, Taiwan) to tropical resorts (e.g. Hawaii and Guam). During Japan’s holiday week in May called Golden Week, and summer and winter vacation seasons, a slew of Japanese tourists enjoy their trips using MAPPLE guidebooks. Amid the highly-advanced information society, we have been creating digital data out of contents we have built up for our paper publications. The digital data include maps of all regions in Japan, information about specific spots, a wide range of travel guides, and road network data. We draw on these data to create a variety of products in addition to paper publications. Today, our digital content is used for such consumer products as car navigation systems and digital cameras, along with many different types of portals and corporate websites, and geographic information systems (GIS) for enterprises and national agencies, just to name a few.